My family and I will be visiting Tokyo and staying a few blocks from Higashi-Ginza station, and I'm having trouble figuring out the best way to travel between the airport and our lodgings. Google Maps and the Keisei site say that the "Access Express" train travels from the airport to that station, but the Access Express site shows a split, and after looking at the Keisei rail map (pdf) I'm just confused. Is this train direct (without transfers)? If it matters, we would want to board the train around 14:00 or 15:00 on a weekend. Or is there an easier way to make this journey? We will have some luggage. There are direct trains, which run on the Keisei Sky Access line or the Keisei Main Line between Narita airport and Aoto station, and then continue on the Keisei Oshiage line and the Toei Asakusa line, as shown on these Hyperdia screenshots. Note the triangle-shaped icons to the left of the station names: they indicate that this is the same train running on different lines, so you do not get off the train at those stations. 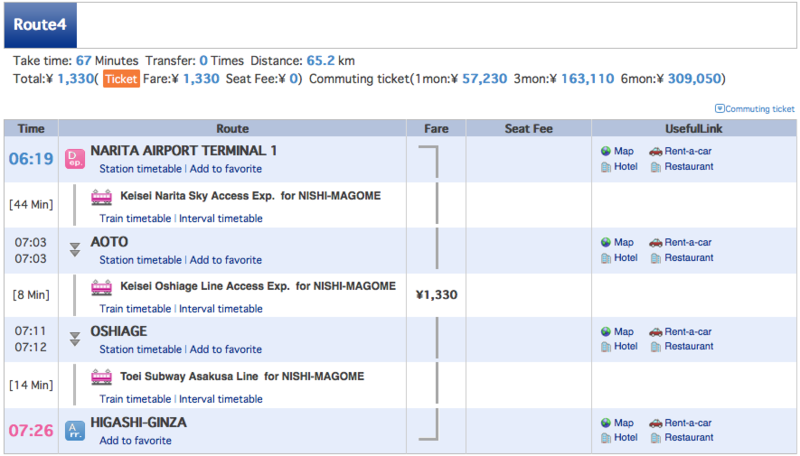 Note also that the Access Express trains (which run on the Keisei Sky Access line) take less time, but cost more. By the way, there is currently no direct train leaving Narita airport between 14:00 and 15:00 and stopping at Higashi-Ginza, but there are some which stop at Nihombashi and Shinbashi nearby, which could be good enough for you. Not the answer you're looking for? Browse other questions tagged trains public-transport tokyo nrt or ask your own question. 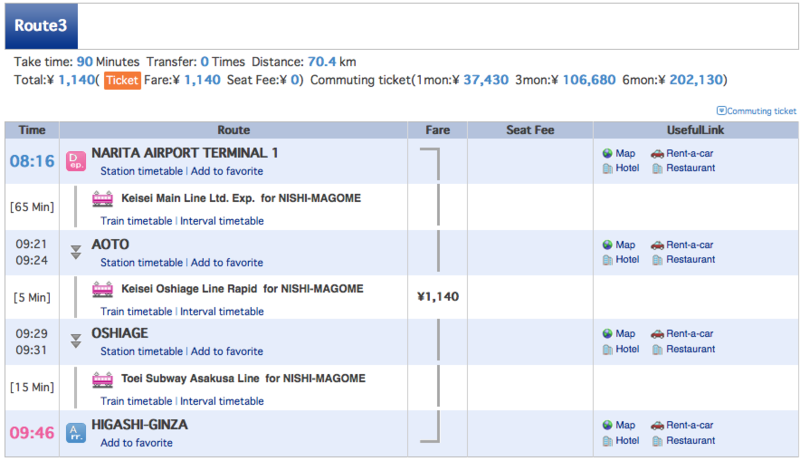 What is the quickest, easiest way to get from Narita Airport to Shibuya Station?